Fibromyalgia is a musculoskeletal condition that causes severe chronic widespread pain. Although there is no known cause for fibromyalgia, there are some factors that contribute to the condition. One of the factors that is known to flare up fibromyalgia is the artificial sweeteners. Studies have shown that consumption of artificial sweeteners can cause an increase in chronic pain and fibromyalgia symptoms. Artificial sweeteners are sugar substitutes that come in many forms and different names. These artificial sweeteners can be several times sweeter than regular sugar. These artificial sweeteners can be used directly in commercially processed foods or it can be mixed with one or more starch-based sweeteners. Artificial sweeteners are widely used in processed foods, including baked goods, soft drinks, powdered drink mixes, candy, puddings, canned foods, jams and jellies, dairy products, and scores of other foods and beverages. There are different types of artificial sweeteners. According to The Sugar Association, there are five artificial sweeteners that are approved for use in the U.S.
Aspartame is known to be 200 times sweeter than sugar. Therefore, its intense sweetness calls for so little of aspartame to be used. Aspartame is broken down by the body into its two component amino acids – aspartic acid and phenylalanine. Aspartame is sold under the name NutraSweet, Equal and Sugar Twin brands. Sucralose is made from sucrose and is believed to be 600 times sweeter than regular sugar. Sucralose is sold under the brand name Splenda. The ingredients are listed as dextrose, maltodextrin and sucralose on the packet. Neotame is the newest of the artificial sweeteners and is also composed of aspartic acid and phenylalanine. It is 40 times sweeter than aspartame but about 8,000 times sweeter than sugar. Saccharin is the oldest of the artificial sweeteners. The sweetness of Saccharin depends on how it is used. It is believed to be between 200 to 700 times sweeter than regular sugar. It comes under the name sodium saccharin, calcium saccharin or acid saccharin. It is sold under the brand names such as Sweet ‘N Low, Sweet Twin and Necta Sweet. Acesulfame K, also known as acesulfame potassium or ace K, and is believed to be 200 times sweeter than sugar. Acesulfame K is commonly mixed with other nutritive and artificial sweeteners and can be listed as acesulfame potassium. Acesulfame K is available under the brand names of Sunett, Sweet One, and Sweet & Safe. 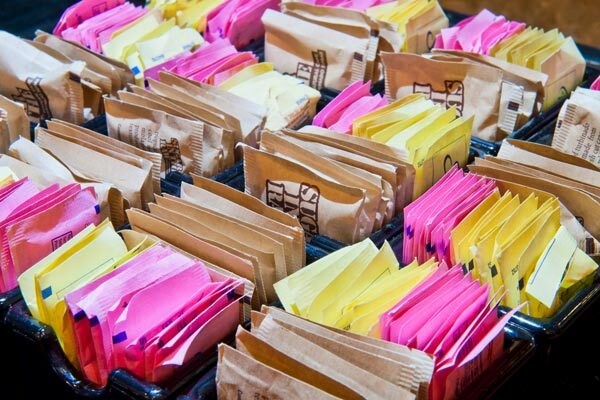 How can Artificial sweeteners affect fibromyalgia patients? There are two artificial sweeteners that are derived from amino acids. These are Aspartame and Neotame. Aspartic acid and phenylalanine are the two amino acids that the body needs for its normal and natural functions. These two ingredients are also used in used in aspartame. The concentration of these amino acids is much higher in artificial sweeteners. According to the FDA, the use of aspartame results in various health problems. It is believed that fibromyalgia is caused or worsened by the chronic, long-term ingestion of aspartame. The two amino acids act as neurotransmitter or neurotoxins and is responsible for transmitting pain, therefore, it is believed to be bad for people suffering from fibromyalgia. According to a study carried out by the University of Minnesota in 2000, patients suffering from fibromyalgia reported higher pain levels in relation to higher levels of aspartate and glutamate in the body. However, it was reported that the patients had higher levels of EAAs when experiencing secondary fibromyalgia symptoms. In a clinical trial in 2001 at the Malcolm Randall Veterans Affairs Medical Center, four patients suffering from fibromyalgia were asked to remove aspartame from their diets. After a few months, all four fibromyalgia patients reported complete or near complete reversal of all fibromyalgia symptoms. The experts concluded that fibromyalgia is induced or exacerbated by excitotoxins. In another case, two studies were carried out by the Burgundy University in 2010. It revealed a link between fibromyalgia and aspartame. In the first study, a woman with fibromyalgia who used to consume artificial sweeteners went on a vacation wherein she did not consume any artificial sweeteners. While on the vacation she noticed that her fibromyalgia symptoms decreased and were symptom-free. After the vacation, she completely stopped artificial sweeteners and noticed a full reversal of the symptoms. In the second study, a man with fibromyalgia who consumed aspartame (artificial sweetener) for three years was recommended to stop consuming aspartame. After the man had stopped consuming aspartame, a complete reversal of his symptoms was noticed. The doctors, therefore, concluded that it was important for a fibromyalgia patient to stop consuming aspartame. How to remove artificial sweeteners from your diet? Removing artificial sweeteners from your diet could be difficult. Here are three tips that you can follow to eliminate artificial sweeteners from your diet. Reducing your intake of artificial sweeteners will be difficult at first. Try to minimize the intake every day. For example, if you are consuming a lot of it, try to eat less of what you already eat with artificial sweeteners. This would help you in reducing your craving for the foods with artificial sweeteners in it. You can replace your craving for sweet by eating fruits that are high in sugar. It is important to note that fresh fruits contain natural sugar as well as various vitamins and minerals that help nourish the body. Keeping a record of the foods you eat and what foods you avoid can be very important in distinguishing what kind of artificial sweeteners in foods really flare up your fibromyalgia symptoms. Fibro Knot or Trigger Point? I strongly believe in this article. My body now rejects anything with artificial sweeteners in it. I don’t even need to read the labels. I can taste it in the first bite and my taste buds immediately decline the food, cookies, artificial drinks.,Etc. I have not used anything with artificial sweeteners in several years I read every label . I do not ache like years ago when I did use them . A nurse told be it take 7 months to get it completely out of your system. I felt like I was poisoned when I consumed fake sweeteners first my shoulders hurt and felt heavy then my mouth and tongue would tingle and my cheeks got this weird feeling kinda pain sensation and this happened often with Diet Coke . So now I only eat things that have sugar in them. What a difference it has made.